Bundesliga | Hannover's Martin Harnik: "seven points means 33 are still missing!" Martin Harnik is the driving force behind Hannover's unbeaten start to life back in the Bundesliga. 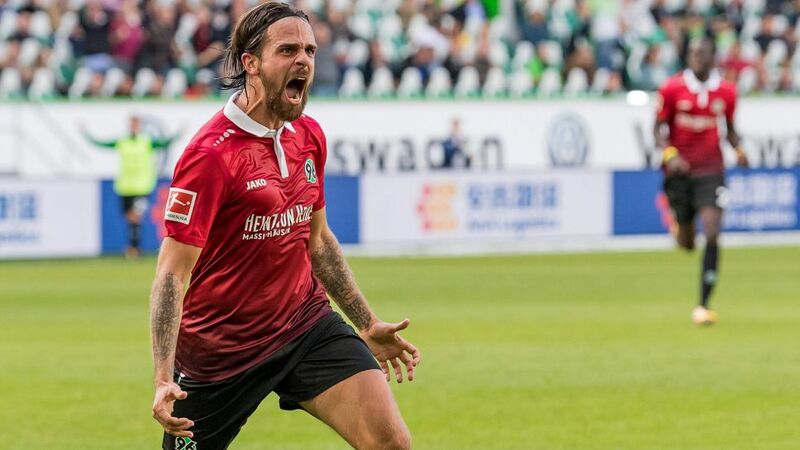 Hannover's Martin Harnik: "Seven points means 33 are still missing!" bundesliga.com caught up with the free-scoring Austria international ahead of the game to get his thoughts on the 96ers' ambitions, turning down a move to China, and his friendship with Werder Bremen forward and fellow Hamburg native Max Kruse. bundesliga.com: Martin Harnik, if Hannover beat Hamburg you could go top of the league - for 24 hours at least. Are you surprised at the start you've made? Harnik: We're not surprised, but we're realists and know what hard work lies behind this. We've earned our seven points so far, and we're proud of that. From our point of view these seven points mean that 33 are still missing in order to be safe. Achieving 40 points is our first big goal. And we want to achieve this goal as soon as possible. bundesliga.com: Hannover have yet to be beaten since Andre Breitenreiter became coach in March. What makes him different to his predecessor, Daniel Stendel? Harnik: I don't want to draw a comparison as I think it's a bit unfair. What I can say is that the coach attaches great importance to the collective and makes every player feel important, whether he's in the starting line-up or not. Everyone feels respected and knows that they can contribute to our success. He's also placed big emphasis on how we defend, right from the start. We didn't concede much in getting promoted and this has continued. This is key. bundesliga.com: You're a Hamburg native. Is the game against HSV a special game for you? Harnik: A game against Hamburg is a special game - less for me personally than for some of my family and friends, many of whom are HSV fans. It's always a great pleasure to play against HSV. Harnik: Max and I were already very good friends before we became professional footballers. We've know each other since playing in the youth team of SC Vier-und Marschlande, and later played together at Werder Bremen. We used to share an apartment. I don't know who's grown up faster (laughs)! Max lives a different life to me, but that doesn't make his choices worse than mine. We're still very close friends today. bundesliga.com: When you were relegated with Stuttgart in the summer of 2016 you could have moved to China, but you decided to go to another Bundesliga 2 team in Hannover. Was this a case of heart ruling head? Harnik: The fact is I had a very lucrative offer from China, but I decided against it as my family and I could not have led a happy life there. The money wouldn't have helped. Everything just fits at Hannover. We felt comfortable straight away. The cherry on the cake is that our relatives in Hamburg are so close - my wife's family is also from Hamburg. It was a logical decision for us. bundesliga.com: They call Hannover 'Der Club'. The city and the club are often seen as sleeping giants. Are they beginning to awaken? Harnik: In the past I've described Hannover as a bit of a grey city, but since I've been here I've learned the truth. The place is beautiful, with a lot of greenery and water. It's easy to feel good here. And Hannover the club have an infrastructure that only top clubs can offer. The stadium is great and our fans provide fantastic support. I've fallen in love with the whole project.